There is more than one place on my website where I talk about my Kaiser experience. It's not a good one. In general, I am not sure there is another HMO out there like Kaiser that has as big a group of disgruntled members. There are even advertisements around here locally that urge people to join online communities and groups that stand against Kaiser. Some of these stories are heart breaking, and it basically all comes down to the same thing: Kaiser is a business. They will cut corners, especially if you need specialized medicine like I did in my case. Kaiser cares about Kaiser. And being a business, Kaiser cares about profit, and from my shoes it's profit before proper care. I've had the unique experience of having jaw surgery with Kaiser and outside of Kaiser. Kaiser is kind of (in)famous in the jaw surgery world, being known for covering your jaw surgery with no questions asked. So, a lot of people who may be doing it more for cosmetic reasons may be more inclined to go with them instead of try to fight another insurance to get it covered. There are some jaw surgery patients who will sing Kaiser praises, and I respect their opinion, but at the same time I will step up and say they can in no way say Kaiser provides standard care or great care for their jaw surgery, because they can't compare it to other care. This was my situation when I got with Kaiser. I didn't know what I didn't know. I didn't know at first it was abnormal to only see the surgeon a few minutes before they do this major surgery on you. I didn't know it was abnormal to not have more xrays and scans taken. I didn't know it was abnormal to only see your doc for a few minutes two times within the first month post op. And the list goes on. Everything....like, EVERYTHING, is just substandard. I'm going to break this up in to pre op, surgery, and post op for my comparisons. Pre op: I only saw my surgeon for two appointments with Kaiser. And at those appointments, I only saw her for a brief few minutes and instead it was a rotating resident doing the whole thing. They sent me for only a basic pano and ceph pre op, and they saw a set of molds 2 weeks before. There was nothing done to investigate the state or health of my joints, my airway, or nasal airway. There was no surgical plan. There is no surgical plan in my records, no surgical plan in my orthodontists records, and there was no surgical plan presented to me pre op despite multiple requests for one. I have spent a lot more time with my revision team, and they have spent a lot more time in the background in my surgical planning. Even from the first consult with my revision surgeon, I could see the care was going to be better and more in depth. The appointment wasn't rushed, and it was 100% with the surgeon himself and not a resident or assistant. I could also tell he had done some work looking at my records and was up to snuff on my case before I even walked in the door. With Kaiser I always felt like they were scatter brained and unfamiliar with my case-- mostly because they are doing 500 million other people on top of you, and quite frankly, you are just another number to them. My revision surgeon spent a lot of time on the front end of my case. He met with my orthodontist AND prosthodontist on his own time outside of office hours to talk over my case and sit down together at a round table to draft up what they should do. It meant a lot to me since I know one of the biggest mistakes the first time with Kaiser was the severe lack of planning. My surgeon did my tooth extraction for the planned ortho, checked in with my ortho through treatment, and saw me quite a bit closer to surgery. He involved me in my treatment, as he knew I needed that this time around. My revision surgeon ordered me for 3d scans and xrays, which he used to do virtual surgical planning. He got these looked at with other doctors to get second set of eyes on the state of my bones and joints. A 3d virtual plan was constructed and presented to me at my final pre op appointment. Nothing was left unanswered before my revision surgery. With Kaiser I could not even get a rough estimate of measurements, let alone a whole plan presented to me at a dedicated appointment for it. Surgery/Hospital Experience: My first surgery was done at Kaiser in Richmond, CA. I think I got a call from anesthesia a few days pre op and told what my show time was to the hospital the day before surgery. Kaiser hospitals are like any regular hospital. I was signed in and sat in the waiting room and I got called back in to pre op bay. I remember being really cold! Part of that was probably jitters, which they would give me nothing for despite multiple requests and being told I would have something. I had just one nurse with me for most of the work up, with two docs showing up about 30 minutes prior to surgery. One of them I recognized as the resident I saw at my 2 week pre op appointment, and the other one I didn't recognize at all and evidently was another one of my surgeon's residents. Still no sign of my surgeon though. The unfamiliar resident seemed to take charge and do everything. Had me confirm what I was getting done and signed consent forms. By the time that was done, I had been in pre op a good 45 minutes and we were about 15 minutes from go time. My surgeon finally breezes by with a cup of coffee in her hand, only saying quick hello before heading in to the OR. I only talked with the anesthesiologist basically on the way in to the OR, where the residents were prepping things and listening to loud hip hop music as I walked in. The anesthesiologist had me out before I even got a mask on over me. Next thing I knew, I was waking up on the OR table and I guess they had just finished surgery. From what I understand from a few friends who are nurses and doctors, this is NOT supposed to happen. My anesthesiologist for revision chatted me up a while before taking me in, and he asked, "So, what do you remember from last time?" and I told him how I remember waking up on the table and the doctors saying, "Her gown is too bloody. We can't send her out in that and need to change it." I remember being stripped down and changed. He seemed pretty damn surprised that this happened, so he made good and sure I was knocked out enough for revision! Anywho, I floated in and out of sleep and fully woke in a VERY crowded and noisy post anesthesia care unit. My family wasn't allowed back there and was going to be able to see me in my room. Problem was...there were no rooms. Not only was I not getting a private room like I was told, but at this moment there were no rooms for me at all. I spent all day in the PACU. A good 6 hours after surgery. My poor family had been waiting since 7am when I got checked in-- 3 or 4 hours through surgery, then 6 hours in the PACU. A nurse did let my husband and mother come back and see me really quick after they could sense all of our unease over this situation. I got put in the smallest room with another lady who was obnoxious (not the fault of Kaiser, but this was just salt in the wound on top of everything else). Nurse presence was little to none. First nurse shoved an affrin tube so hard up my nose it immediately started to gush blood and continued to do so for hours after. My mom had to stay awake all night and hunt nurses down to change my ice bags around my face. I asked to be taken off of the morphine drip because it was making me dizzy and whacked out when I tried to get up and walk, and I was informed that if I wanted basic tylenol or advil they would have to inconvenience an on call doc and call to get it on my orders since it wasn't on there to give me instead of morphine. They really guilt tripped me over this, so after going back and forth a few minutes, I told them they can just forget it-- take me off the morphine and I'll suffer with nothing for the rest of the night so they don't have to do their job and get the on call doc to authorize me a simple advil to take overnight. And that is exactly what happened. I spent the next 10 hours in the hospital with 6 broken bones, a ton of fresh stitches, and 6 sets of plates and screws new in my face with not so much as a hit of basic advil because the nurse didn't want to be inconvenienced to do her job. In the morning my surgeon was supposed to come by and check up on me and clear me for discharge home if all looked well. Nope. Instead it was the resident who appeared to be running the case for the most part for my surgery the day before. I was scheduled for xrays at an external facility around day 8 post op, and then scheduled to see my surgeon on day 12 post op to be unwired. I was discharged home to heal. Thank goodness I cut off the pain meds in the middle of the night and could walk myself out, because there was no wheel chair assist for me. Like everything else, my revision hospital experience was quite different. With Kaiser, I had never been in a hospital before. I didn't have anything to compare it to. My revision surgeon practices privately and does most of his procedures in his office-- standard tooth extractions, wisdom teeth, dental implants, etc. For jaw surgery, he operates out of the John Muir medical center in Walnut Creek, CA. Pretty awesome and state of the art place as far as I've heard. I was told I was being taken care of in the surgery center on campus, which made me a little nervous since it wasn't technically the actual hospital (which was kind of still in the same building, but surgery center was off on the side of it). I was assured if something went south, I would have everything I needed from the hospital right there. I checked in around 11:15am for my 12:25 surgery. I was taken back right away, gowned and vitals done, IV in, and pretty set up to start talking to the operating team by noon. The biggest difference right off of the bat? I was warm! They had heated blankets for you in the pre op area. And while it was busy, I had a team of nurses just for me. The nurses that would be in the OR with me stopped by to see me and chat, the nurses taking care of me after stopped by to say hi, and my surgeon himself walked in the door around noon and went over everything with me for a while, making sure I understood everything we were about to do. The anesthesiologist was able to sit down and pow wow before hand as well. I got a sense this time that this was a warmer welcome and a much more organized group effort; a well oiled machine and everybody knew their role. I was glad I got to talk to my surgeon this time. He seemed fresh and ready to go. My anesthesiologist was a sweet heart too. AND he gave me stuff to calm me down this time. No anxious tears going in to the OR like I did with Kaiser. I felt much more relaxed! Kaiser actually walked me in to my OR and I had to get up on the table. This time I was wheeled in. The room seemed smaller, but there were more people there. I feel like at Kaiser all I saw was the two residents and the anesthesiologist when I walked in. This time I saw the whole team I had just met-- the anesthesiologist and a nurse who wheeled me in, the two nurses from my surgeons office who were assisting, the OR nurses, and then the last face I looked at was my surgeon as I floated off to sleep. One of the things that still haunts me about my Kaiser experience is the fact that to this day I have no clue how much of the surgery my actual surgeon did-- if anything at all. I didn't see her when I got wheeled in, she didn't write my operative report, she didn't do my discharge or talk to my family, and almost all of the surgeons I've seen in the years since actually have a hard time believing my face was a product of her work because it was just that bad. A few of the surgeons even went as far as to come right out and say they are pretty certain its purely the work of a less experienced doctor like the residents, but who knows what went down when I was out. All I know is that this time, I drifted away looking right up at my surgeon. I don't think it was a mistake that he was there for me to see as I floated off. He know what I've been through and I think he knew I needed to see his face. I knew I was in good hands this time. I woke up in a quiet recovery area with a nurse right next to me and my husband and mother right at my other side. I woke up to complete chaos in the Kaiser PACU. Couldn't get a nurses attention and was wired shut and dry throat from all the tubes so I couldn't speak loud enough for a nurse to hear me at first. My surgeon had been the one to come out and let them know how everything was going about half way through surgery, he came out when we were done to talk to them again, made sure I was in recovery and stable before he left, and briefed the overnight nurses on my care. It was pretty nice waking up with my family this time and hearing the words, "everything went OK and everything looks really straight and dead on!" Not only did I have a room this time, but I had my own suite with my own bathroom. Two nurses were staffed overnight just for me, and I had to ask for nothing. My ice was changed out frequently, pain meds given when they were scheduled/needed, I was constantly checked up on. They even offered to walk to another part of the campus and get me an odwalla smoothie instead of drinking down nasty hospital broth. I had help to get up and get to the bathroom this time. I have these vivid memories of trying to walk and almost passing out at Kaiser, which is why I cut off the morphine in the middle of the night there. The care was great overnight at John Muir. Before I knew it my surgeon was there at 7am to check up on me before heading over to his office for the day. Again, it was so relieving to see his face and not some random assistant or resident I had never met. He made sure I was feeling OK enough and wanted to go home and since I was, he agreed to let me go and had me scheduled for a follow up 4 days later at his office. The nurses wheeled me out to the car, and thank god they did, because I needed it this time. The anesthesia (probably because I got more of it this time?) really wiped me out and I barely remember leaving the hospital and getting home. Post op: This is really where the care difference is huge so far. Again, the first time, I didn't know what I didn't know. I didn't know it was abnormal to have so few appointments with your surgeon. Or not have your surgeon check on you after the procedure the next day when you went home from the hospital. I got discharged by the random rotating resident my first surgery. And after that I wasn't scheduled to see my surgeon until 12 days post op to get unwired. I got xrays taken at an external facility and brought with me to that appointment. I got a huge thumbs up that everything looked great, xrays looked great, and I got unwired and sent home. My ortho was set up to see me around 3.5 weeks post op after that, and surgeon again at 4 weeks post op. I had a large bulge sticking out of my lower left jaw, but my surgeon said I must have ripped a stitch and caused an infection and hematoma on that side. I got some antibiotics and sent home with otherwise a glowing diagnosis at that 12 day check up. The check up itself was brief, with the first half of it being done by the resident, and then my surgeon came in to give the quick check and unwire me and send me on my way. They didn't really spend a ton of time looking at or cleaning up my incisions, or looking up my nose or doing anything with that. It was like they just glanced at everything minimally and were like "OK, stamped, and good to go. BYE!" The bulge on my left side wasn't going away. And after being unwired and getting some motion back in my face, I started to notice how twisted and crooked everything was. I saw my orthodontist at 3.5 weeks post op, and as much as he didn't want to admit it, he said things weren't quite right and asked me to bring it up with my surgeon in a few days at my 4 week check up. The surgeon didn't say anything until I finally said things were off. This is the point where she looked at me, admitted the top jaw could be canted down 2-3mm to my right, and then shoved me out of her office saying, "I'll get in touch with your ortho and I'll be in touch!" She was never heard from again for the most part. I kept going to my ortho, who pretty much was mum on the whole thing. Said he wasn't in touch with my surgeon (and who knows if that is really true-- I bet they were and he was acting dumb and just stringing me along), had no clue what to do, and then he started wildly yanking my teeth around for no reason except to cover up all of my surgeons mistakes, which were so bad that it was obvious I was immediately a surgical revision case and my ortho had ZERO business even laying a hand on me. This went on for another 1.5 months until I saw my first surgeon for revision consult and I found out how bad I actually was. I then started to go on more consults and it was the beginning of my process of putting my new team together. In this time I had still never heard from my surgeon. 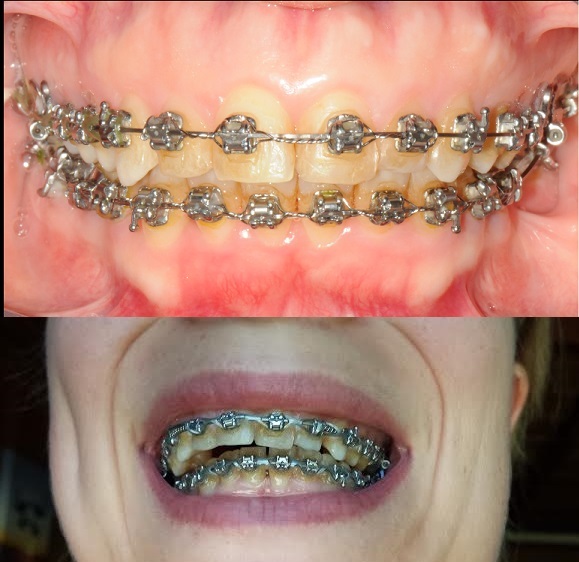 3 months post op I filed a complaint through Kaiser against her, and then magically all of the sudden at 4 months post op, my orthodontist said, "Hey, Dr. O'Ryan just sent me a message and said she's going to look at your records and get back to you." Phhhffftttt. Yeah, right. That is what I heard 4 months ago when she abandoned me freshly broken and in need of being taken care of, and it was awfully coincidental that she gets in touch with me only AFTER a complaint was filed against her that I am sure she now knows about. No thanks. At that point I was one foot out the door getting with a whole new team, and by 6-7 months post op, I made that full transition to my new ortho and surgeon and began my revision retreatment. The bottom picture was my bite around that 8-10 weeks post op last time. And Kaiser was OK with that!!!!! Kaiser was giving me the thumbs up to THAT! All was well, just sent me home, and then when I finally spoke out about it at 4 weeks post op, I got shown the door and never heard from them again. And then after my complaint went through and I got denied coverage to see and get retreated with a surgeon of my choosing outside of Kaiser, I got a letter from them stating that they were basically OK with my treatment and feel that their treatment is so great that they don't need to cover anything else and I should continue to get treated through Kaiser and Kaisers world class surgeons to fix the mess that one of their world class surgeons left me with. Well, their chief of their maxfac department, who should be the best of their world class, did this to me and totally abandoned me. But that kind of care is OK with them, I guess. I am sorry, but it's evident in my comparison of care in the pre/surgery/post op phases in this section, the maxfac care they provide is NOT OK. Its not standard. Not even close. It's unfortunate that I had to go through this experience, but I definitely have this unique perspective now to be able to compare care between two jaw surgeries, and all I am going to say is my explanation of the care I received speaks for itself, and my results speak for themselves. There is no excuse for what my first surgeon and Kaiser HMO did to me. And even after the fact, they are OK with it. That is standard care to them. So, please, for anybody reading this blog considering jaw surgery with Kaiser, do yourself a favor and go elsewhere if you truly want a better shot at getting at least the standard care you deserve. ***EDIT AS OF OCT 2016*** As bad as my experience was with Kaiser, I am still trying to keep an open mind that not every single Kaiser facility is going to fall within the lines of my bad experience, and likewise, not every Kaiser doctor will as well. Sadly I am still hearing some horror stories regarding Kaiser Oakland, especially still about my first surgeon. I've unfortunately had to counsel around 5 of her patients that have found me in the last year (and who knows what others are out there that haven't found me) and help them sort themselves out to get help to get seen for revision. On the flip side, I have heard of some good Kaiser experiences. I've heard of a few good reviews coming out of Kaiser Anaheim. One patient I talk to a lot raves about a Dr. Bell down there. I've heard of a few good things about Kaiser South Sacramento. On the flip side of that, I have also seen one of the most negligent cases in all of my time involved in jaw stuff come out of Dr. Jun at Kaiser South Sacramento. So, this is probably a "your mileage will vary," thing with regards to Kaiser. One thing I can for sure say is after my own treatment and now helping quite a few others who were left damaged by my first surgeon, that Kaiser Oakland and Felice O'Ryan are to be avoided. And after the case I've seen from Dr. Jun at Kaiser South Sacramento, that is another one that should be avoided at all costs.